I've been having fun with our new brand this week - I know you all want the trees and we're hoping to get them back again in time for Christmas, but in the meantime, I wanted to highlight some of their stamps which are fabulous quality and have some unusual quirky designs. 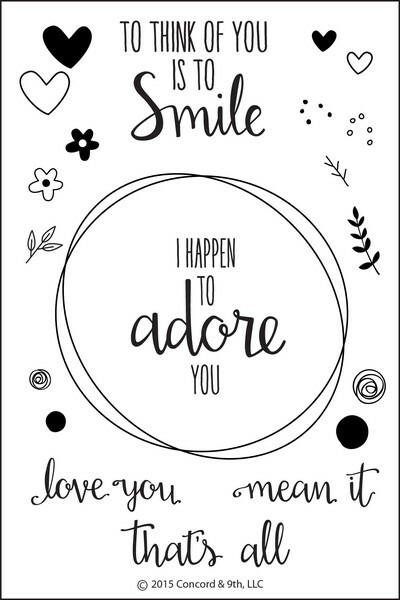 I wanted to focus on Love You, Mean It as I adore the wreath base in that set as it is so versatile. So I have four projects using the wreath as a base. Two for Christmas and two for all year round. For the first one, I went as simple as you can with just black stamping, and introduced colour using another one of Concord and 9th's innovative products - "paper route". 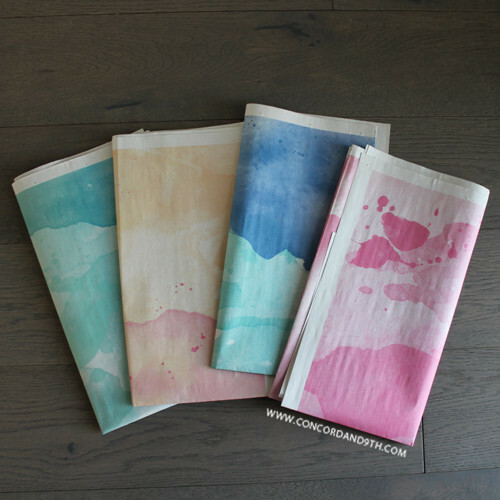 These are sheets of newsprint style paper (huge sheets!) with fabulous designs printed on them. This one is a double sided "washes edition" with lots of interesting patterns - you could cover about 15 cards from a single sheet and you get 4 per pack. The second one I did back wreath again and used some of the flowers also in black with the trend of stamping the colour deliberately off centre for the retro look. I stamped the wreath less times here for a cleaner finish. For the Christmas versions I added some extra sets. 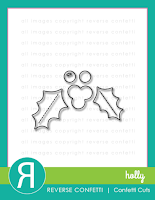 The card uses the wreath stamped 3 times in brown onto kraft with baubles from Mama Elephant's Jingle Greetings stamped and embossed in red. 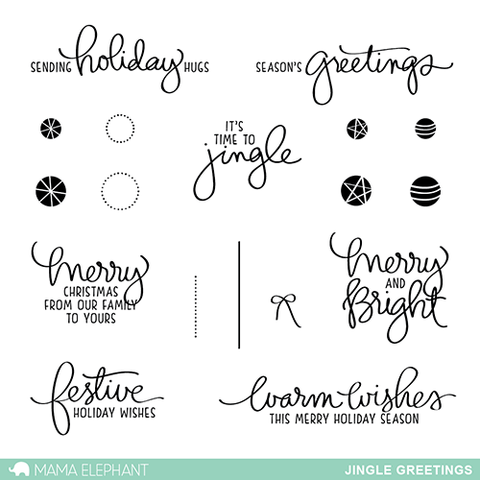 The greeting is from Jingle Greetings too. Then finally - I give lots of bottles of wine at Christmas and hate wine bottle bags so I am always looking for interesting ways to add a gift tag and I thought the wreath would make a fun tag to just sit over the bottle. Here I started with embossing the gift sentiment from another Concord and 9th set called Lots of Blots in gold, masking it off and then stamped the wreath 4 or 5 times until I had a nice thick circle. I trimmed the centre with a craft knife and cut the outside with scissors. To finish I added a sprig of holly using my favourite holly die from Reverse Confetti - its a great size for decorating presents and the dotted fold line gives the leaves lots of extra dimension. We have Altenew restocks in transit - should be here this week at some point. Avery Elle have a new release on 3rd December - we have it ready to go as soon as they release in the USA. 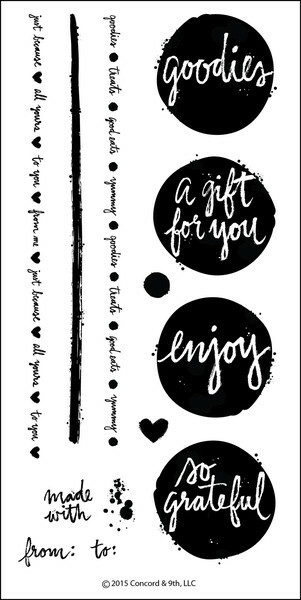 Lil' Inker Designs have a new release on 9th December - again we'll have it on release day. 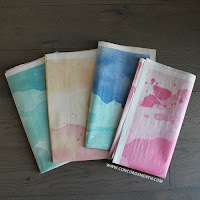 We have ordered the last two releases from PaperSmooches and hope to receive them this week too. 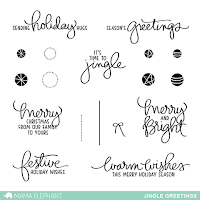 There will also be new releases from MFT, Mama Elephant, Lawn Fawn and Wplus9 before we close for Christmas. 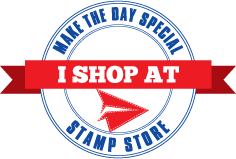 Welcome to Make the Day Special Stamp Store's blog - the place where our talented design team bring you daily inspiration using the vast range of brands we stock. Peace & Leaf & Wreath!